In September 1987 an English language worship service was being held regularly on Sunday evenings in the chapel of the International Baptist Theological Seminary in Rüschlikon. This service was led by two American missionary families who were associated with the seminary: Charles and Bobie Cottle and Wes and Jean Miller. At the same time, the German-speaking Rüschlikon Baptist Church was holding bilingual Sunday morning services in the seminary chapel. Noting the growing attendance at the Sunday evening services, the team believed the time had come to establish an English-speaking church. A place to meet was found in Wädenswil, at the Hotel Engel, and a small group began worshiping there on Sunday mornings. On December 13, 1987 the Lake Zürich Baptist Church was established with 18 members. Ben Leslie, a student at the Rüschlikon seminary, served as pastor. A highlight of 1988 was the church’s January move into the Evangelical Methodist Church building, on Rosenbergstrasse in Wädenswil. The Methodist service concluded at 10 AM, which gave several members of the English-speaking congregation an opportunity to meet for choir practice. For the next few years, the International Baptist Church became known for its special music program since they were fortunate to have many opera singers in the congregation. The service began at 11 o’clock, followed by a Bible Study for adults. This schedule was typical as long as the church met in Wädenswil. In April of 1989 the church name was changed to the International Baptist Church of Wädenswil. 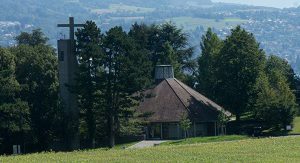 (This was done to accommodate the other Swiss lakeside Baptist churches in Thalwil, Horgen and Rüschlikon,) Also in that same year, the church joined both the Swiss Baptist Union and the European Baptist Convention. In 1995 when the Baptist Theological Seminary in Rüschlikon relocated to Prague, Czech Republic, the European Baptist Federation elected not to sell the chapel along with the other property. Instead, it was given to the Swiss Baptist Union for their use. They, in turn, offered it to the local Baptist churches for their use as a worship center. With the departure of the Seminary population, the bilingual Rüschlikon Congregation was decimated, the remaining families decided to merge with the existing Thalwil congregation. This congregation already had its own building and did not wish to relocate. The International Baptist Church of Wädenswil had been experiencing space problems for quite some time, and gladly accepted the invitation to rent the building as the sole tenants, seeing it as an answer to prayer. The chapel, however, was in great need of renovation. The European Baptist Federation allocated a sizable amount for replacement of the heating system and for structural repairs. Additional funds were needed to convert the basement into useable Sunday School space and a fellowship area. The Rüschlikon Baptist Church generously contributed a large sum, even though they were no longer going to be using the building regularly. The remaining balance was contributed by the congregation and interested individuals. Renovations were completed in February of 1996, and a Dedication Service with participants from both the Rüschlikon and Wadenwil congregations was held on March 3, 1996. In anticipation of the move and given the close proximity to Zürich, the church changed its name to the International Baptist Church of Zürich (IBCZ) in 1996. In November 2016 IBCZ finished the extension of the Seminary Chapel. Parts of the terrasse has been changed into two new rooms that can be used for Sunday School. Today IBCZ has primary use of the former Seminary Chapel in Rüschlikon. As has been true throughout the history of IBCZ, it is an ever-changing group of people. The congregation encompasses people from all walks of life, many countries, and from various denominational backgrounds. As Christians we are a church Family and belong together because we have the same God. We consider IBCZ to be a “home away from home”, for people of all nationalities living in Zurich, and we love the multi-cultural congregations we have every week. We strive to offer Christians and those questioning Christianity a warm welcome, and a place they feel safe and cared for. Every Sunday we worship our God together in our morning service, and we have Home Groups to make you feel at home here and find new friends. IBCZ is a place where we want you to grow in the Word and in your relationship with Christ. Spiritual Growth happens in all the different ministries of our church and we desire to equip people with practical wisdom to live meaningful lives by offering helpful courses on marriage, parenting and leadership. We put a large emphasis on children at IBCZ, with active groups for children and the younger members of our congregation. Christianity doesn't stop when you leave church, it starts. That’s why we encourage and support each other to find our unique mission or field of ministry – that might be the workplace or home, and either here in Switzerland or further afield all over the world. We want to help and support you to share the Gospel with your friends and around the world as we are all called to be the salt and light, impacting our generation for Christ. IBCZ also has formal links with Churches and ministries in other parts of the world.